CEE has been working in the State of Bihar for the past 15 years. The focus of CEE's work in the State has been environment education in schools, water, health and sanitation, and awareness generation. The Bihar State Pollution Control Board (BSPCB), Bihar Education Project Council (BEP), Bihar Institute of Public Administration and Rural Development (BIPARD), Bihar Rural Livelihood promotion Society, Panchayati Raj Department, Patna Zoo, Regional Science Centre and 12 partner NGOs, etc are the agencies with which CEE has been working in the state. Facilitating NGC as a Resource Agency in all 38 districts of the state, with activities spread across 8,971 schools. Providing support in organizing training programmes for master trainers and development of resource material. 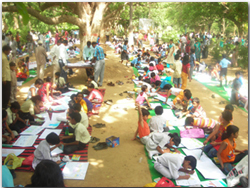 Conducted school level events and activities on environment related days. Visiting NGC schools in district to compile and monitor field level experience of schools. Paryavaran Mitra programme is being implemented in all NGC schools of the State by facilitating refresher State level master trainers training programme, district level meetings with district education officials, organizing events etc. Implementation of Ganges river dolphin – Conservation Education Programme in six districts of the State. Selection of partner agencies and schools along the river side of Ganga, Kosi and Gandak is being done to conduct yearlong intensive conservation education programme. Organizing school events like competitions, guest lectures, exhibitions etc., on the occasion of International Biodiversity Day, World Environment Day, Earth Day, International Ozone Layer Protection Day, and other environmental days. Provided support to UNICEF’s SSHE programme in the State. The programme involved training of master trainer and teachers; development of educational material; demonstration in schools etc.